"Being a production planner requires Lou to work closely with several different teams — from having technical conversations with engineers to project status updates with supply chain managers or tactical conversations with the factory staff. Lou’s prior experience, combined with his MBA and passion for cars, made him the perfect fit for this position." "I’m fortunate that such an innovative company chose Pittsburgh for their self-driving headquarters. I’m also very thankful for my Point Park education, which applies to my job on a daily basis." How did you become a production planner for Uber? The employer of the job I had while in grad school announced they were closing their Pittsburgh branch shortly after I would be graduating so I was job hunting as the days counted down toward unemployment. Fortunately, I had maintained a positive relationship with my manager, who was contacted by Uber as they built their team for the autonomous vehicle division in Pittsburgh. My manager referred me, which definitely gave me an advantage in the interview process and helped me land the position of operations analyst. Now as a production planner, I help coordinate the builds of the self-driving cars, ensuring we have enough materials to complete any scheduled project plans. I’m fortunate that such an innovative company chose Pittsburgh for their self-driving headquarters. I’m also very thankful for my Point Park education, which applies to my job on a daily basis. What factors made you choose Point Park for both your undergrad and graduate degrees? My dad studied at Point Park, as the second class under the business management Saturday fast-track program. I watched him successfully complete his degree, while still working full time. When it came my time to look at various business programs, I knew I also wanted an opportunity that would allow me to continue working full time. While most schools offer evening classes for full-time workers, this was not ideal for my schedule. After a work day in retail, the last thing you want to do is rush into the city for class! Not only could I complete both degrees on the weekends, but it was also a condensed number of semesters from most traditional programs. My undergrad experience in business management was so positive, I didn’t hesitate to come back for my MBA degree. How have your business management and MBA classes helped you in the work you do? As part of the job application for Uber, I had to complete an assignment to test my knowledge of production planning. My global logistics professor at the time agreed to let me use this assignment as my final project for the semester, which ended up being a great example of how the class applied to real-life scenarios. 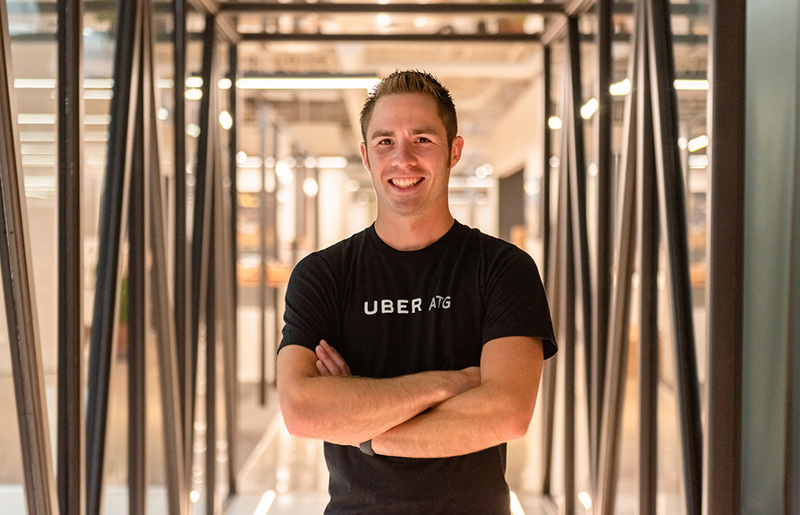 That opportunity was not only a step toward completing my master’s degree, but it also helped me land my job at Uber ATG. We also had one professor who always harped on the economic model of supply and demand. At the time, it felt so simple and even elementary, but now I find myself always referencing that lesson and constantly using it in my day-to-day work, from simple to complex applications. One of the best parts about the business management and MBA programs was the camaraderie with fellow students. We were with a core group from our first semester through graduation. Everyone had different strengths and we easily became support for each other, helping everyone do well in classes in which we may have otherwise struggled. I’ve maintained friendships with many of these classmates years later — including my wife, Emily DeShantz, who completed her MBA with me in the same program! Business management may seem like a broad, generic major, but it makes it possible for graduates to go in a variety of directions, rather than being locked into one career path. I’m thankful I chose to study business, even when the opportunities didn’t seem relevant. For instance, I never planned to work in inventory, but by accepting that opportunity, I ended up with the best job I could’ve hoped for only a few years into my career. I advise prospective students to keep their options open and never turn down an opportunity. All experiences are positive, even if they ultimately lead you in a different direction. They may also open the door for the career you never would have achieved without keeping an open mind.